What a sweet baby! But then they are all sweet at that age. Little Valentine is doing great. She let me scratch her all over her body yesterday and you could tell she enjoyed it! What a cutie.I love to watch lambs play, they look as though they have springs for legs. Many of my friends are now checking out your blog and enjoying it as much as I do.Thank you for all your work. Did you see my post last Sunday? oh, is that adorable! Do the lambs stay that curious chocolatechipcookie ice cream color or do they change to white or black? They are so sweet. What ever possessed humans to encourage sheep to lamb in mid-Winter? ah, i love the ears! mmm, sheep milk cheese... do you make cheeses??? My little baby Jeffolina! Too cute! How could you not name her after me?? Thanks so much for telling your friends about FF. I really appreciate it and am so glad you're all enjoying it. Her face is black like her daddy's! I hope it stays that way, but it'll probably lighten up a bit. 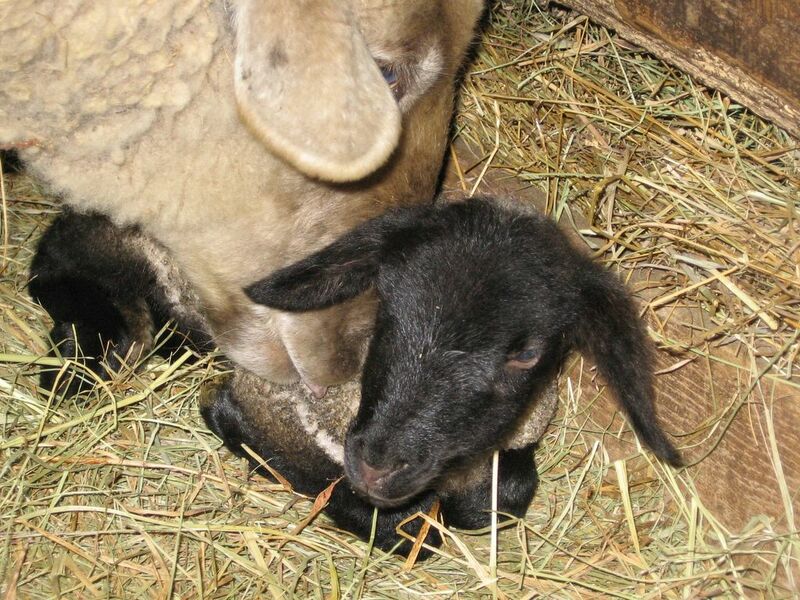 My favorite lambs are the ones born completely jet black. Gorgeous! Some people have a field full of all-white newborn lambs. Yawn. We get all kinds of gorgeous shades of brown and grey and even silver--and of course the infamous chocolate chip spots. Sadly, they will all fade to white real soon. Some will keep their dark faces and legs (that's the Suffolk in them, which is what Leopold The Ram is). Believe it or not, my sweet Teddy boy was born completely black! Welcome to the farm! Well, the lambing cycle is not completely in our hands. Most sheep (there are exceptions with special breeds) are 'in heat' from August through December. The gestation cycle for a sheep is 5 months. Mmmmm. Sheep milk cheese. Absolutely love it. Definitely don't make it. You see, unlike goats and cows, there isn't much to hold onto when you're milking a sheep (and I speak from experience). Commerical sheep milk farms have specially designed equipment to do the job. It's pretty much impossible to milk a sheep by hand in a timely manner. Um, Jeffolina? Jeffolina? No offense, but, well--Jeffolina?! And besides, how could you forget that the girls this year will all get "C" names (except, of course, Clare's "Menu For Hope" lamb--but more about that soon). This picture is really sweet and Martha's baby is beautiful!